Republican senators vented frustrations over U.S. efforts to fight Islamic State (IS) radicals, and grilled Secretary of Defense Ash Carter and Chairman of the Joint Chiefs of Staff General Martin Dempsey at an Armed Services Committee hearing Tuesday. During testimony, Carter acknowledged publicly for the first time the United States was only training about 60 Syrian opposition fighters to battle the Islamic State group as of July 3. U.S. policymakers had hoped the program, launched in May in Jordan and Turkey, would train as many as 5,400 fighters a year as a strategy of engaging local partners to combat extremists. Carter cited rigorous U.S. vetting of recruits, adding that number would increase as the United States learned how to better streamline vetting. McCain described Obama's strategy against the Islamic State group as "delusional," and told Carter there's no compelling reason to think anything the U.S. is doing will be enough to achieve Obama's goal of degrading and ultimately destroying the jihadist group. “Our means and our current level of effort are not aligned with our ends,” said McCain, a Republican. “That suggests we are not winning, and when you are not winning in war, you are losing." “While our coalition may own the skies, as the president said yesterday (Monday), our air campaign against IS continues to be limited significantly by overly restrictive rules of engagement and a lack of ground intelligence, which only gets worse as IS moves into urban areas to avoid coalition bombing,” he added. Carter defended the president's policy while acknowledging that more needs to be done to strengthen the mission to train local forces to combat the Islamist extremists. "The strategy for defeating ISIL in Iraq and Syria is to support capable and motivated forces" on the ground, Carter said, using another acronym for the Islamist group. He also stressed America will deal the Islamic State group “a lasting defeat” in Iraq and Syria through multiple lines of effort, from political and military efforts to providing humanitarian aid. Carter and Joint Chiefs of Staff Chairman General Martin Dempsey testified before the Senate panel a month after appearing at a similar hearing of the House Armed Services Committee. In his opening statement, Dempsey repeated the importance of local fighters and regional stakeholders in fighting the Islamist militants. Dempsey has previously told the committee he would not hesitate to recommend ground troops if and when the situation requires them. So far, he said, he has made no such recommendation to the president. Some Republicans have long urged the deployment of U.S. special forces to help battle Islamic State fighters on the ground in Iraq. McCain criticized President Obama for ruling out ground combat forces. Another Republican, Jeff Sessions, said Obama’s 2008 campaign pledge not to embroil the United States in another ground war in the Middle East must yield to current-day realities. 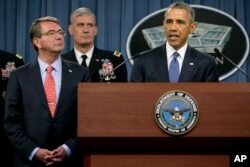 Monday, Obama met with Carter and top military commanders and intelligence officials at the Pentagon where he pledged to defeat the Islamic State group without dragging America into another ground war. “There will be periods of progress, but there will also be some setbacks,” added Obama, who once conceded the U.S. lacks a "complete strategy" to battle the militants. Monday's meeting followed a weekend of intensified airstrikes by a U.S.-led coalition against the militants, who have taken control of large swaths of northern and western Iraq and eastern Syria. President Barack Obama, right, speaks to the media after receiving an update from military leaders on the campaign against the Islamic State, during a rare visit to the Pentagon, July 6, 2015. Defense Secretary Ash Carter is at left. President Obama noted that, in all, coalition forces have conducted more than 5,000 airstrikes against IS positions. Obama spoke of a continued, multipronged campaign in which coalition forces attack Islamic State militants from the skies while taking steps to root out the group’s financing and strengthening local forces for ground operations in Iraq and elsewhere. He noted the militant group’s success in reaching out to potential recruits in faraway lands, including the United States, and said defeating the Islamic State group will require more than military might. VOA's Michael Bowman contributed to this report from Capitol Hill. Some material came from AP and Reuters.